The Eastern School of Fretted Instrument Repair has been approved by the Department of Veteran Affairs for the Montgomery, Post 9/11 and Forever G.I. Bill. 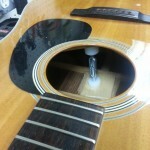 This enables Veterans to attend the Eastern School of Fretted Instrument Repair at little or no cost out of pocket. We work with all veterans to include disabled.from all different military backgrounds. Regardless of time served, if you have a DD-214, you may be eligible for vocational re-training funding provided by Department of Veteran Affairs. See your nearest local VA representative to find out what you may be eligible for. Here are two veterans and recent graduates from our school talking about their experiences at ESFIR and what they are up to now. https://www.ebenefits.va.gov/ebenefits-portal/ebenefits.portal – To check your eligibility and to apply for benefits to discount Veterans Guitar Training. http://www.gibill.va.gov/ – Find out what’s needed to be eligible, and see different options for schooling and veterans services. http://www.va.gov/ – The main Veteran’s website. To apply for the Eastern School of Fretted Instrument Repair Veterans Guitar Training , we need 3 documents. All graduates leave the Eastern School of Fretted Instrument Repair with a lifetime point of reference and resource, as we offer a constant lifeline of technical support, general business guidance, and industry assistance as well as always providing access to the schools facility to past graduates for continued education and as a workshop resource. The course of study at The Eastern School of Fretted Instrument Repair is fast paced, in depth, and finely detailed, with a thorough testing of student knowledge performed at the end of each instructional block. At the successful conclusion of the program, all students will receive a certificate of graduation along with a list of necessary resources and supplies.